The four Gospels are full of accounts of the amazing miracles performed by Jesus. In this new book Lois Rock retells a selection of some of the most memorable and intriguing miracles giving an insight into the divinity of Christ. The selection includes: Water into wine, Stilling the storm, Walking on water, Feeding 5,000, Jairus' daughter, Hole in the roof, Great draught of fishes, Ten lepers, Man by the pool, and Man born blind. 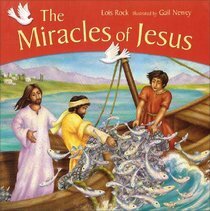 About "The Miracles of Jesus"
Lois Rock has established an international reputation as a children's writer specializing in Bible stories and prayer books, which include "My Very First Bible "and "My Very First Prayers," Gail Newey is the illustrator of "Best-Loved Parables" and "Our Father,"